To be or not to be (together)….that is the question. Milkweed is the only game in town for hungry monarch butterfly caterpillars. It’s suggested that milkweed be planted in patches of at least 6, so that caterpillars won’t run out of their incredible shrinking food source. However, that doesn’t mean these milkweed patches need to be deserted islands within your garden. In our garden, we have stand alone milkweed patches but we also have patches with nectar flowers and other milkweed varieties mixed in. What interesting milkweed mixes have we tried over the years? 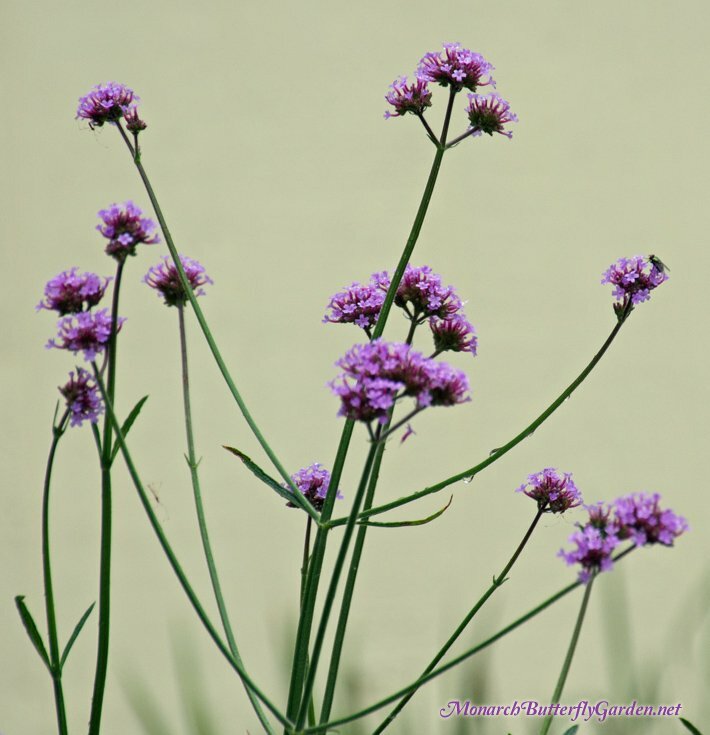 Verbena grows up to 6′ tall and branches into spiky purple prongs. The stalks are thin, and the flower heads small, which makes this an excellent see-through plant. Plant them anywhere, in and around your patch, without blocking sunlight from other plants. Get more info about verbena here. 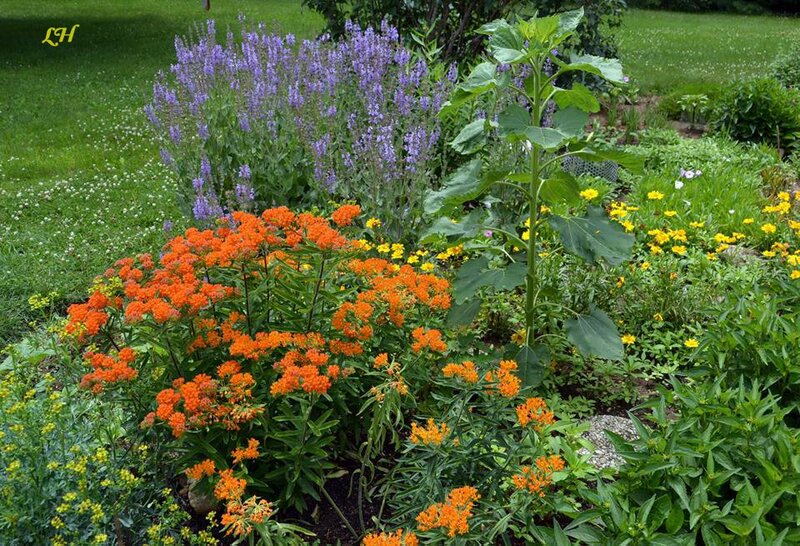 Some milkweed varieties that might look good with verbena are Asclepias purpurascens (purple milkweed), Asclepias tuberosa (butterfly weed), Asclepias viridis (spider milkweed), and Asclepias curassavica (‘silky gold’ tropical milkweed). Monarchs on the west coast and in New Zealand will eat tweedia leaves (Oxypetalum caeruleum), but the jury’s still out on whether monarchs will deposit eggs on it in other regions. 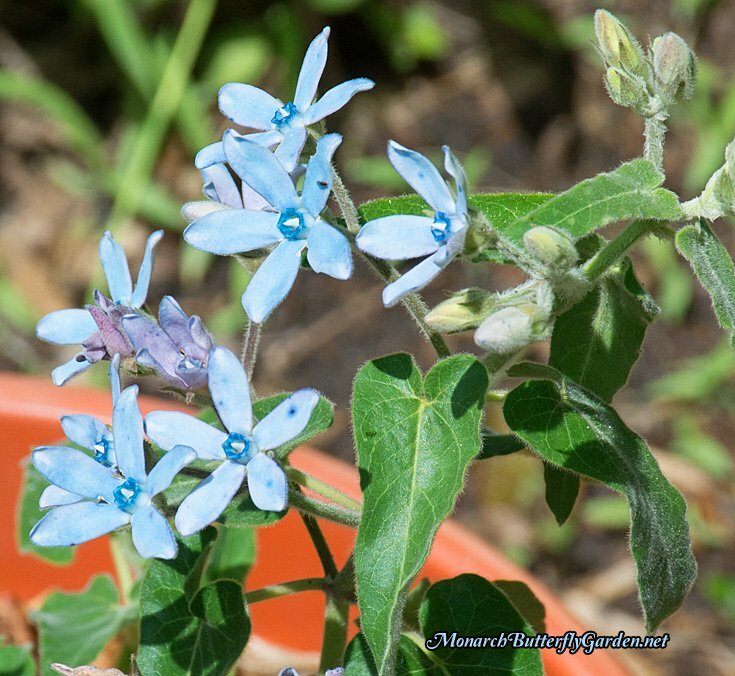 There aren’t too many flowers that exhibit this pretty blue hue, and no other milkweed does. I’ve paired ours with ‘ivory’ buddleja buzz butterfly bush. Buddleja buzz also comes in magenta, velvet, sky blue, and purple. Both of these companions grow well in containers. Other compact butterfly bush varieties would look good too. The contrasting colors of purple and orange blend together in a strikingly beautiful way. This photo below is possibly Salvia nemorosa ‘cardonna’. The more compact ‘may night’ cultivar is a darker purple salvia that would also be a good choice. If you like hummingbirds, black and blue salvia would make a great butterfly weed companion too…lots of grape options! Don’t forget butterfly weed also comes in sunny Hello Yellow, in case a purple and yellow color combo is more your style. When I originally posted this, it was with a hybrid mistflower variety. Sadly, it has not become widely available, although I suspect it has hybridized with the wild ageratum (Concoclinium coelestinum) in our garden. We also grow Texas mistflower (Conoclinium greggii), and overwinter a single plant indoors in case it doesn’t survive our harsh winters. In our northern region, I prefer wild ageratum because it comes back in spring (by seed) and flowers all season. For those in warm regions, Texas mistflower may be a better option for supporting your monarch needs. Asclepias asperula, verticillata and viridis are short, native milkweed varieties that would make fine companion plants…really, most any milkweed species would pair well with this because this is a ‘background plant’ that is easy to remove, and a top monarch attractor…we also threw some contrasting red clover into the mix this season. Since many milkweed species serve as host plant for caterpillars and nectar source for butterflies, milkweeds also make good companion plants for each other. Asclepias tuberosa (butterfly weed) has pretty yellow or orange flowers while tropical milkweed comes in orange/yellow, ‘silky red’ or ‘silky gold’. There are, at least, a couple beautiful combinations with those options. Perhaps ‘silky red’ tropical with ‘hello yellow’ butterfly weed? 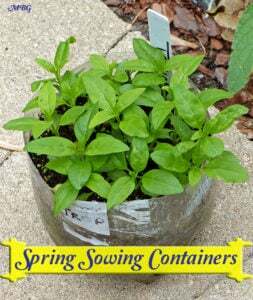 Tropical milkweed can also be potted annually and moved around to complement the butterfly weed. Asclepias incarnata ‘ice ballet’ is a swamp milkweed cultivar with white flowers that grows a couple feet shorter than the regular variety. Place it in front so it receives plenty of sun. Pair an early blooming milkweed with a late one. Asclepias viridis (spider milkweed) is a spring blooming milkweed with thicker leaves that a hungry cat can appreciate. Asclepias verticillata (whorled milkweed) has tiny pin-shaped leaves that aren’t likely to satisfy large monarch caterpillars. Both are shorter milkweed varieties that top out around 3 feet. The dark green leaves of the ballon plant and the vibrant yellow of sunflowers contrast beautifully. If you are growing ballon plant (Gomphocarpus physocarpus) annually, you’ll definitely want the sunflowers as your back border. In perennial zones, you may want to experiment with placement to see which plants grows faster…and taller! There are many other milkweed companions that work well together in butterfly gardens. What are some of your favorite companion plants for milkweed? Please share your favorite combos below. 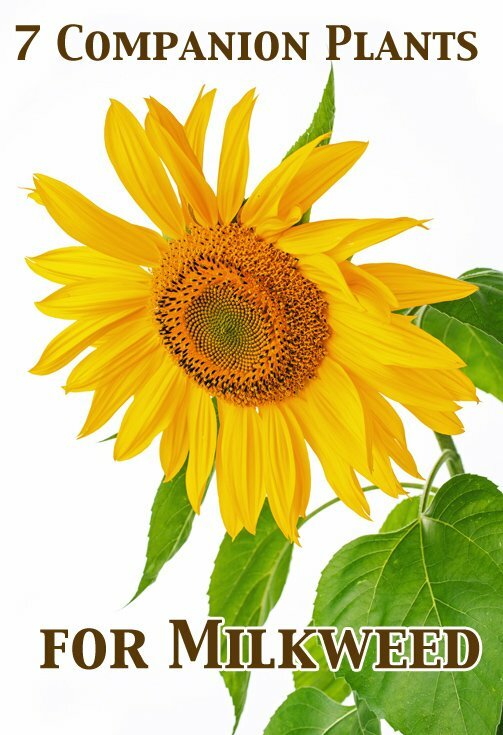 My sunflowers are being eaten by finches…they eat the leaves…I have tried CD’s and a large flower windmill. not sure what to tell you Janet. On occasion, I yell at them out the window when they’re plucking petals off the zinnias…they just look at me like I’m crazy 😉 you could try putting out a feeder to divert their attention. I live in Central Florida and butterflies haven’t touched my milkweed! I have stick plant…the cats eat it up every time…had about 45 at one time about 2 weeks ago.. They devoured the plant and are off turning into butterfly! Hi Susan, what species of caterpillars are you talking about? I live near Kansas city missouri, our winter was so warm , I am wondering if the milkweed seed got cold enough long enough to germinate properly. Have you gotten any word of pour germination. 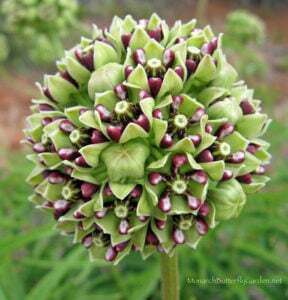 Balloon milkweed was reclassified as a Gomphocarpus species about 20 years ago. The two species of milkweed from Africa that are available in the USA are G. fruticosus (swan-shaped fruit) and G. physocarpus (the larger fruit, rounded). If you’d like me to send you the paper from the international Botanical Society, please let me know. Hi Jacqui, this info was updated on the website a long time ago, but I missed the update on this page…thanks! Even though it’s getting cold outside, and the 2014 growing season is coming to an end, we are already planning for 2015. I read about the monarch ageratum and it sounds like a nice little plant that we would like to try. I read that you wanted to test it out before promoting it on your website. Forgive me, and I’m not trying to rush your judgement, but I haven’t been on the computer that long, and I’m not sure where to go when you say that you will be posting more information on the monarch ageratum soon. Would you post the information under this same article, or would it be posted under a new article. Hi Brian, I would update this article, but also post it on my butterfly garden plants page. I am still waiting for information about when/if this will be available commercially. I am a butterfly enthusiast that lives in sunny south Florida! I have always enjoyed providing milkweed for my favorite butterfly, the majestic Monarch. Usually, I would be caught running out to a local nursery to buy additional milkweed plants in an emergency when my hungry caterpillars would strip my existing plants of all their leaves. This spring/summer, it appeared that I was ahead of the game. Several milkweed plants had sprouted up from seed pods, so many that it looked like a small forest of milkweed! Some of my milkweed grew to over 7 feet tall! I would occasionally see a Monarch, but noticed no eggs on the leaves. It was starting to occur to me that maybe the numbers of Monarchs were down due to loss of habitat, pesticides, etc. Fortunately, within the past few days, I have finally noticed eggs and caterpillars in various sizes on a lot of my plants. 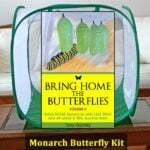 Maybe I will after all be participating in the Monarch migration! I am linking pics below of the “milkweed forest” lol as well an area on my patio where I have potted milkweed for those caterpillars that are about to pupate. So far I have 10 .
wow, that is tall Karen! I’m happy if our tropical is 4 feet up north. I’m happy to hear you are finally seeing some eggs and that you will be able to help raise the Migration with us! What do you think about Phlox Jeanna as a companion plant for milkweed? Do you think it would make a good Monarch/butterfly attractor? Hi Chris, I have not personally grown Phlox ‘Jeana’ but from what I’ve heard about it, it’s more of a tiger swallowtail nectar source. Swallowtails also visit many milkweed varieties for nectar. As a Pennsylvania Master Gardener, I’m using more native plants in my pollinator gardens and encouraging other other folks to do the same. 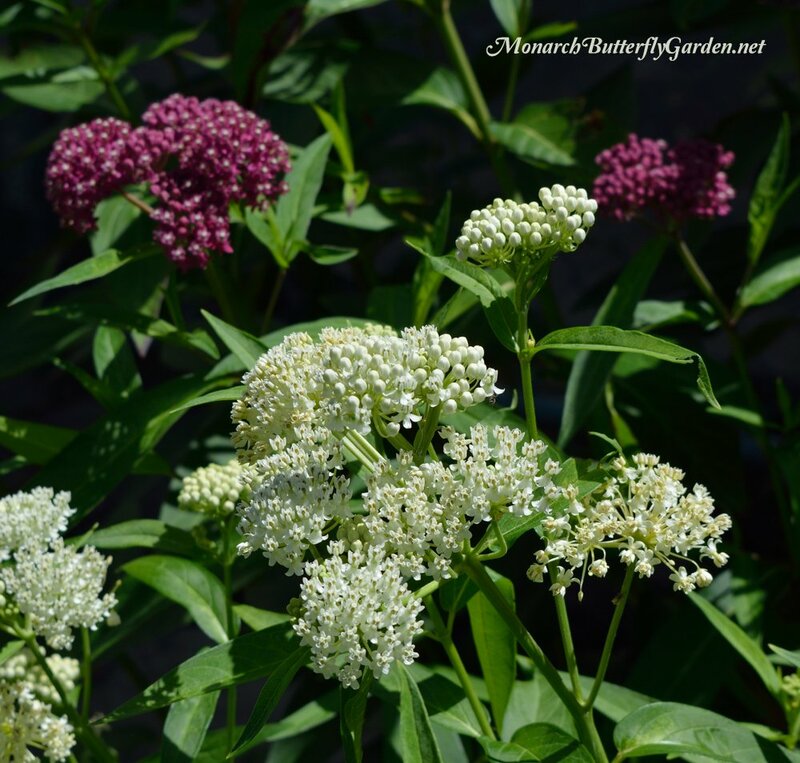 I’ve found that Queen of the Prairie ( a very striking but under-used plant ), Purple Coneflower, Common Milkweed, and Swamp Milkweed make a nice combination in shades of pink with different heights and textures. Vibrant orange Butterflyweed goes nicely with them, too. Hi Pam, we actually have some purple coneflowers with common milkweed this year, but I’ll have to give “them” the credit for growing together. 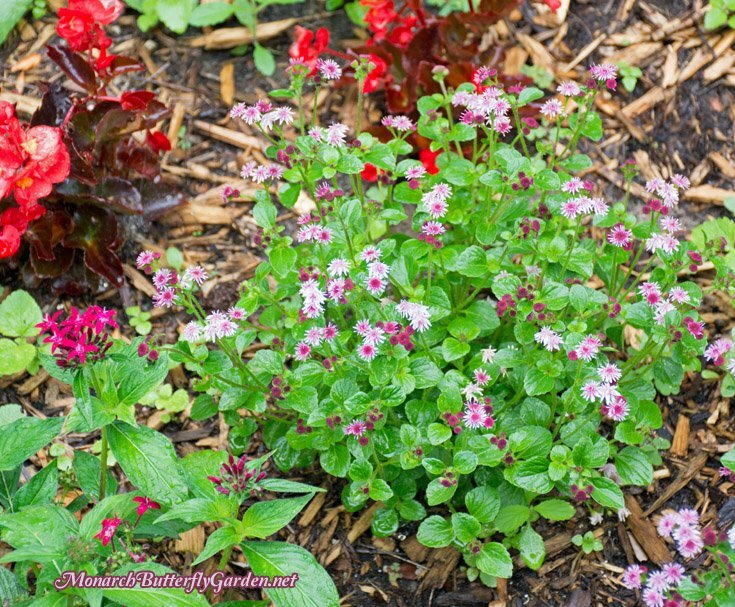 We grow lots of natives, but use non-invasive tender perennials/annuals to complement them. I have found this attracts more monarchs and other wildlife to our butterfly garden. Thanks for the Queen of the Prairie suggestion…I will have to give that one a try! An interesting article. You will be interested to know that Kew Gardens renamed the balloon plant which you refer to as Asclepias physocarpa as Gomphocarpus physocarpus – so some people might find it on sale with the latter name. Their reasoning is that this is an African plant in origin and the Asclepias are from the Americas. Also, the Gomphocarpus species have a double layer to the fruit (seed pod) which you don’t see with the Asclepias species. On another note I think you are describing the plants above as being aesthetically pleasing in one’s garden, complementing the milkweed species – is that correct? Do the plants you are suggesting as companion plants also provide nectar for Monarchs? If so, I am thrilled to learn that the Buddleia Buzz family still provide nectar for butterflies (and bees) and the wide range of hues in the flowers. But presumably they don’t set seed which is why a lot of Buddleias are considered problem plants. Hi Jacqui, thanks for your comment. I did realize the change had been made (the new botanical name is on my plant page) but did not know the reason why. I am guilty of still using the old one, and will do better going forward. 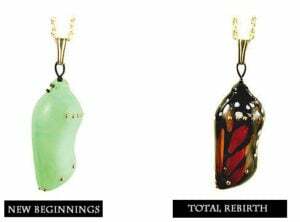 As for the companion plant suggestions, all of them are a nectar source for monarchs and more. I also tried a sterile variety of butterfly bush and that didn’t attract anything. I’m giving it one more year to redeem itself. The buddleja buzz has been a great nectar source for monarchs, swallowtails, hummingbirds, bees, and more. Buddleja buzz is not sterile, but it does not seed invasively like the large varieties. Ours comes back each season in our cold climate, but I haven’t had to pull one seedling in 5 years growing it. I have had success with good ol’ zinnias…!! !….They grow perfusely and are easy keepers. Butterflies, pollinators and goldfinch love them. However, be mindful not to sew the seeds too close to your milkweed as zinnia leaves are quite large and may block out some sunlight. Hi Betsy, I agree with your zinnia suggestion…and your warning! I planted a large state fair zinnia too close to my balloon plant and it was definitely blocking sun from the milkweed. However, I went outside this morning to find something had chewed through the entire zinnia stalk…such a shame, but I the milkweed will be getting plenty of sun again! Hi, just to say I grow the low-growing zinnia — we call them “Mexican Zinnias”– but don’t know if that is a good name or just our local description. I’ve reseeded them myself for over 20 yrs., and they are all over my garden. They bloom all through the late spring, summer, and fall until our first freeze and are the best! And they don’t grow taller than my butterfly weed. Hi Carolyn, I think you are talking about the “persian carpet mix” which sounds like a great idea. Thanks for sharing! I have a stand alone patch of annual and the swamp weeds . They do well there and are covered by butterflies. I have other swamp weeds in the blue garden with mallow and vinca, purple, coral and red porterweeds. Got to find the Monarch ageratum. Where do I find them? Can I order them? Is that what they are called? Pray you have a blessed Lord’s day, take care and may God Bless you always. Love, in Christ Jesus, Joan (Sr. Brigit, BSCD) mom of Shawn, always on our minds, forever in our hearts. Just a short comment about the verbena. The good news is that they grow like weeds and self propagate so once you have them you have them pretty much forever. The bad news is that in NY they tended to mildew in Summer. Not all of them, but like phlox, you have to pull a lot out because if they get to close they just get that damn white powdery growth and look awful. If you don’t mind pulling out bad plants they are OK, but they give you so little in the way of color I am not sure it is worth the trouble. I am presently still fighting to grow some giant and swamp milkweed in Florida. Those plants are not happy and I don’t think they like the heat. I have about a half-dozen struggling to survive, a few as white as zombies, but if I get even one or two from seed it was worth the trouble. The giants at a nursery down here sell from $19.99 to $24.99. For milkweed? I will take my chances with a $3 packet of seeds. No telling yet how this will turn out. I think I might end up with 3-4 plants but it is still an iffy thing. after the record rainfall we’ve had in Minnesota this spring/summer the only affect it’s had on the verbena is that some of its over 6 feet tall. I like it because the prongs add visual appeal to the garden and it attracts TONS of pollinators…top 3 butterfly plant every season. Good luck with your giant milkweed! I have tall verbena that has gotten the powdery mildew. I find that if I only water in the morning, that stops it. They need to be completely dry before nightfall. 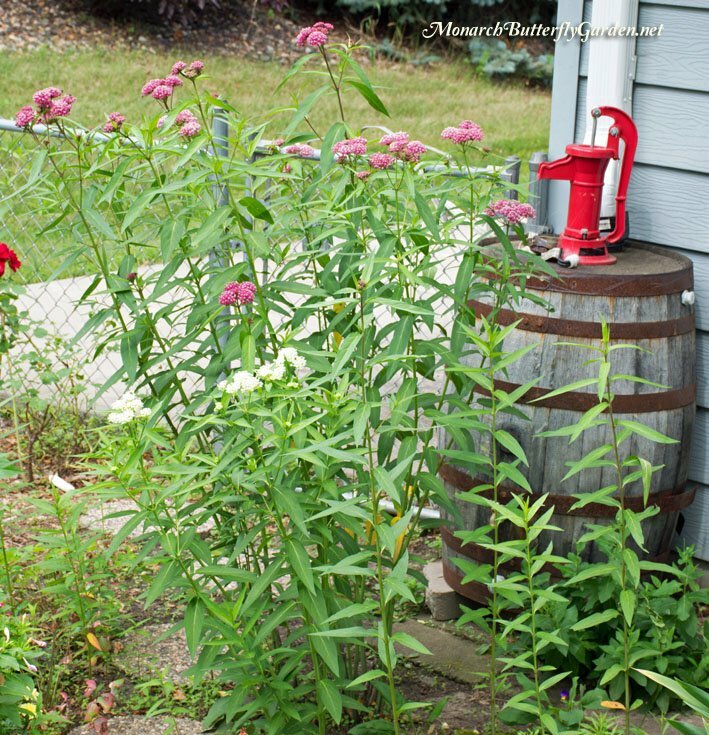 great tip Stacey, and a good reason to utilize morning watering for all garden plants.